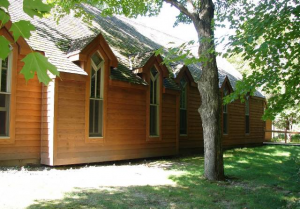 I work as administrator of a small retreat center, the Episcopal House of Prayer, in Collegeville, Minnesota. It was built in 1990, part of a strong tradition of ecumenical collaboration that happened at Saint John’s Abbey, who lease us the land on very generous terms. 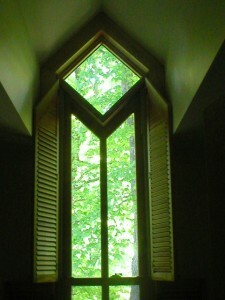 One of the best things about the retreat house is the architecture. Most people refer to it as “Arts and Crafts” style, but I learned something about it from a visitor last week. Standing in the back of the building, he pointed to the window and said, “Did you know that is based on the Whipple arch?” I had not heard of a Whipple arch or of Bishop Whipple, the first Episcopal bishop of Minnesota. The Right Reverend Henry Benjamin Whipple (1822-1901) was one of those great pioneer churchmen in the Midwest, known for his work with the Indians and for the little churches he built all over Minnesota. What I learned from Wikipedia is that his churches were built in what is called the “Carpenter Gothic” style, also referred to as “Rural Gothic,” which has many variations, but basically refers to wood churches (and other buildings) built by house carpenters who imitated stone gothic features using wood. I don’t know about the term “Whipple arch,” but it is likely the churches he built all had wood gothic arches. The style was made possible by the invention of the steam-powered jigsaw, which allowed woodworkers to make more intricate details from wood, what we often think of as “gingerbread.” It is interesting to me that the Episcopalians built their churches from wood, which is plentiful in Minnesota, while the German Catholics built field stone churches with stones hauled from their farms. The most famous example of carpenter gothic is a house in a painting I saw just two weeks ago at the Art Institute of Chicago. I stood before it a long time, but didn’t make the connection to our arches at the House of Prayer. 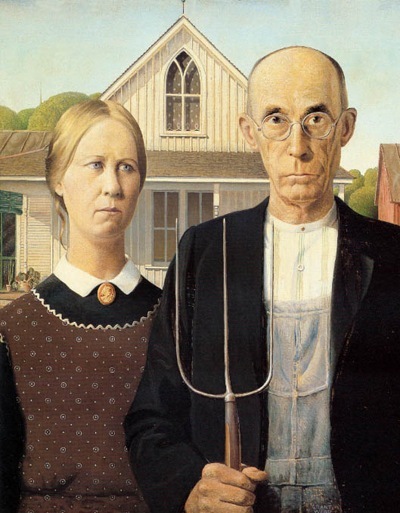 Now I’ll always see that Grant Wood farming couple as Episcopalians, standing before their (Iowa) Whipple arch. This entry was posted in art, religion, St. Joseph. Bookmark the permalink. I'm not sure how you got here-- this blog is now at susansinkblog.com. This site will always redirect, but please update your preference and register at the new blog page! Thank you!